Who's Protecting the Abused Elderly? Elsie Fossum's nieces and nephews say she was the aunt you wanted to have. “She gave us our first car!” said Janet Flynn, Fossum’s niece. Sitting in the sun-dappled backroom of a lakeside home in Walker, Minn., the Fossums remembered their aunt. Elsie Fossum was a teacher who never married or had kids. 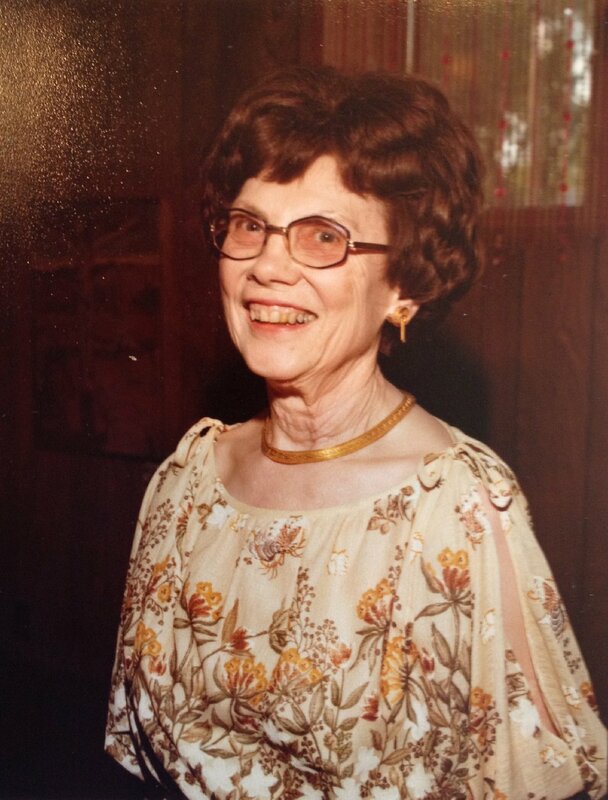 After moving to Southern California in the 1940s, she worked mostly as a librarian. On the morning of July 3, 2006, Elsie Fossum lay in a pool of blood on her bedroom floor at Claremont Place, a Los Angeles-area assisted living facility where the 95-year-old woman had lived for two years. Her eyes were bruising black, her lip and upper palate were badly cut, and her right arm was broken. “She looked like she went four or five rounds with Muhammad Ali,” Beverlee McPherson recalled when Fossum returned from the hospital. McPherson, a registered nurse, supervised the nurse assistants at Claremont Place. Nurse assistants provide intimate care. They bathe, feed and dress the elderly, ill or disabled. The lone caregiver on Fossum’s floor that night reported Fossum fell, but McPherson and other Claremont Place staff suspected abuse. Less than three weeks later, Fossum died. Her 109-pound frame succumbed to her wounds and to dehydration. Fossum was unable to take much food or water through her swollen mouth. A Los Angeles County coroner could not rule out assault and called the manner of Fossum’s death undetermined. McPherson is resolute. Emergency room nurses who treated Fossum at the hospital also suspected abuse, according to official records. 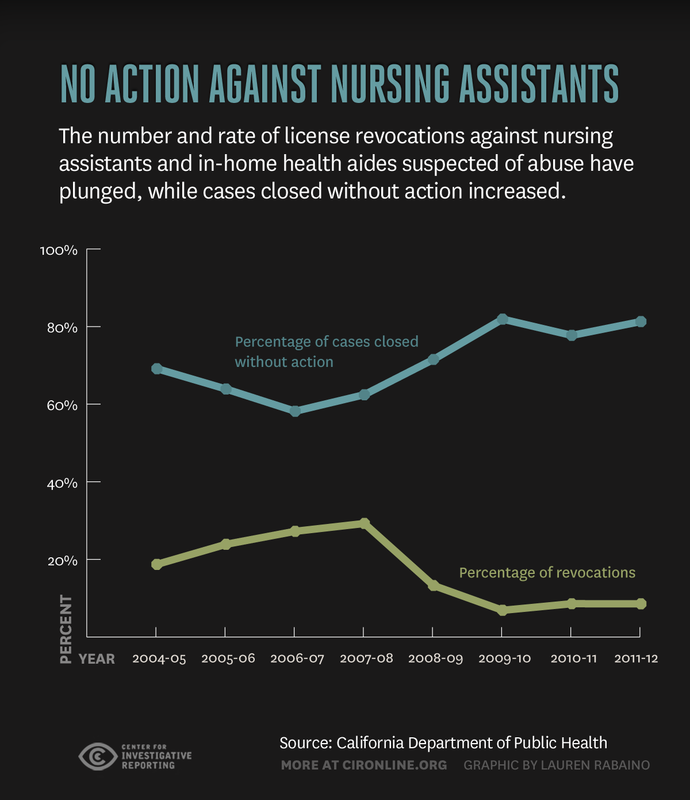 The hospital quickly notified the California Department of Public Health, the agency responsible for de-certifying nurse assistants and home health aides who violate standards of care. Internal documents obtained by the Center for Investigative Reporting show department investigators shelved Fossum's case for 6½ years. In February of this year, department investigators closed the case and determined no action was warranted against Fossum's caregiver. After her aunt’s funeral, Janet Flynn said Claremont Place staff alerted the family that Elsie Fossum may have been a victim of elder abuse. 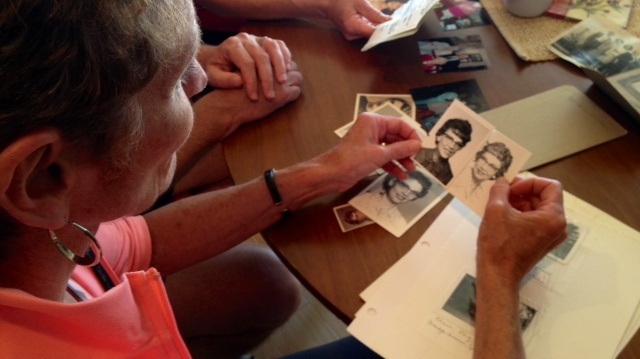 Seven years later, the family is no closer to understanding what happened to their aunt. Their calls and emails to state agencies and local police turned up little information. They have never heard from California’s Department of Public Health. The Los Angeles County Sheriff’s Department has decided Fossum's case warrants further review. A detective there said they opened a homicide investigation into her death this year. Fossum's caregiver is the sole person of interest. Fossum’s case is not the only one where department investigators were slow to act after allegations of physical or sexual abuse. In October 2007, nurse assistant Ricky Diocampo molested a 59-year-old female patient at Del Rio Sanitarium in Los Angeles County. This was not the first time Diocampo had assaulted this woman, court records would later show. In 2009, Diocampo pled guilty to patient abuse. It was not until two years after his conviction that officials with California's Department of Public Health revoked Diocampo’s certification as a nurse assistant. Diocampo did not respond to phone calls, notes or visits to his Long Beach home. It is unknown whether Diocampo worked at other care facilities in the years before state regulators acted against him. Woods said cases languished during his tenure because of a sprawling backlog of hundreds of complaints. He said his investigators lacked the training to handle complex cases, and he had too few investigators to begin with. 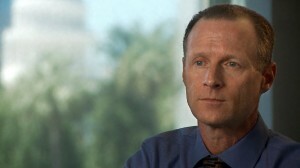 Woods left his position in 2008. 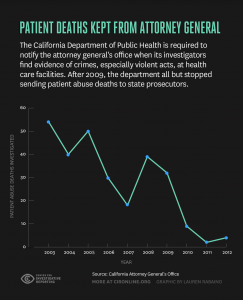 From 2004 to 2008, public health regulators piled up more than 900 cases in Southern California -- cases that involved severe injuries and suspicious deaths. Chapman said a plan was implemented in 2009 to address the backlog. But since Chapman's been on the job, the number of nurse assistants who have lost their certifications has dropped dramatically. In fiscal year 2008, the department revoked or denied certifications in 27 percent of cases. In fiscal years 2011 and 2012, that number dropped to 9 percent. Chapman said he sees no evidence that addressing the backlog has undermined the quality of the department’s investigations. But Marc Parker, who led the investigations section for nine years, said he was forced to cut corners. Parker said without facility visits, investigators are unable to see the layout of a room, conduct impromptu interviews, or assess a person's body language. Public health regulators are legally bound to report all suspected criminal wrongdoing to the state attorney general's office. Over the three years before the department addressed the backlog, it referred 88 deaths for criminal prosecution. But that number has plummeted. 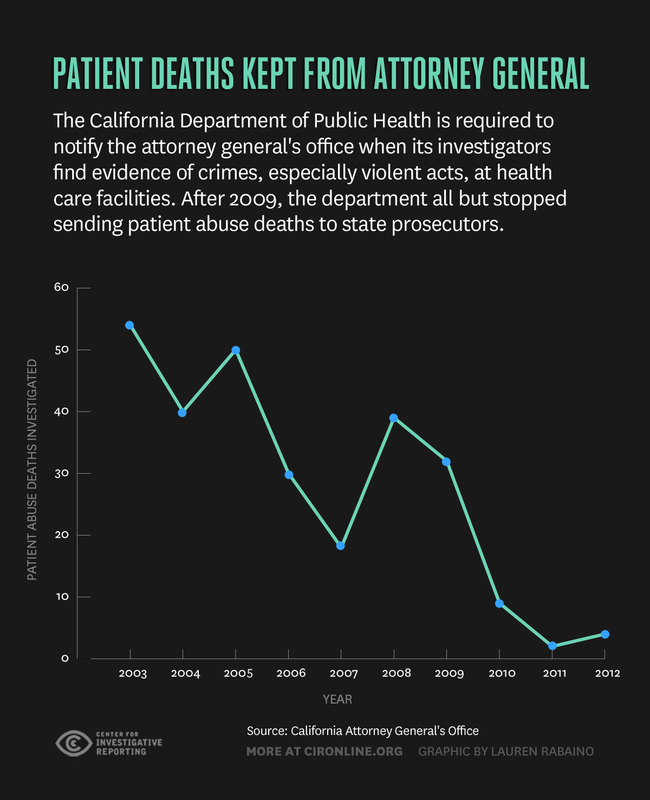 In 2011, the department referred two deaths. Paul Greenwood, who has been prosecuting elder abuse cases for nearly two decades as head of the San Diego district attorney’s elder abuse unit, finds that baffling. Chapman said his staff is drafting agreements with the attorney general's office to improve communication and work better with them as a partner. Chapman said while he's confident no complaints have been mishandled, he is open to the possibility of reviewing closed cases, including the death of Elsie Fossum. This story was co-reported with Ryan Gabrielson of the Center for Investigative Reporting. 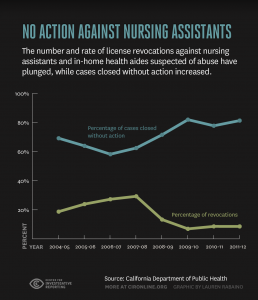 Read his story, Quick dismissal of caregiver abuse cases puts California patients at risk.